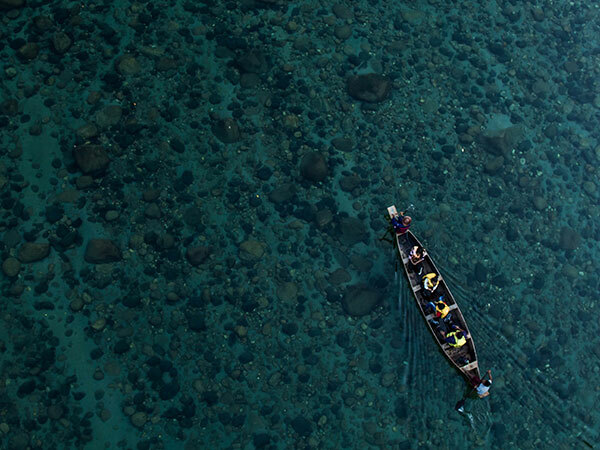 Nongpoh, in Meghalaya, is one of the prettiest and most underrated parts of the country. Situated on the National Highway 40, Nongpoh is studded with stunning pastures, cascading waterfalls, and glittering lakes all throughout. Nongpoh has numerous tourist spots; hence, for all that travel can offer, the places in Nongpoh altruistically shower more than what one can discern. Here are some of the places you can sneak-a-peek into and definitely must visit when in Nongpoh. Nongpoh has a pleasant climate all throughout the year, hence, making it a year-round destination. The summer months are more favourable than the winter months though, as the summer months have an average temperature of 20°C-25°C. By Air: The closest airport to Nongpoh is located at Guwahati, which is at a distance of about 34 km from the town. Frequent cab services are available from the airport. By Rail: The nearest railway station to Nongpoh is located in Guwahati, Assam which lies at a distance of about 34 km from the town. The station is the major railhead that is well connected to other parts of the country. By Road: The Guwahati Bus Terminus is the nearest bus station to Nongpoh that connects the town to all the major parts of the country. The Nongkhyllem Sanctuary is the most distinguishable bird sanctuary in the area. With colourful vibrant birds fluttering around the sanctuary, the place is home to several exotic migratory birds as well. With birds like rufous necked hornbill, and brown hornbill, the Nongkhyllem Sanctuary is a bird watcher's paradise. The sanctuary also houses some great variety of wildlife from the- Himalayan black bear, Royal Bengal tiger, clouded leopard to many reptiles as well. Sprawling over an area of 29 sq km the sanctuary remains open to visitors all throughout the year. When in Nongpoh, you must visit the Umiam lake, the pristine lake, that resides at the heart of the town. The lake and its surroundings look unreal and right out of a picture post-card. Sprawling over an area of over 220 sq km, the lake, in reality is a reservoir of a dam that is also known to be the first hydro-electric plant in the entire North-east. The natural splendour of this spellbinding lake is sure to leave you awe-struck. The lake also has a water sports complex on its banks. The words 'Dwar Ksuid' literally translate to 'devil's doorway, and is indeed a very fascinating pool that makes for a great tourist attraction in Nongpoh. The place is famous for its incredible humongous rock formations. The majestic rock formations resemble that of a lotus that impart an all total unique charm and beauty to the place. Flanked by many sand boulders, Dwar Ksuid is popularly by this name, as it is believed that the devils assemble here. The meaning of Lum Sohpetbneng, which translates into ‘the navel of the earth', is actually a sacred place for the locals and has great historic and religious significance. Legend has it that at this very place the seven tribes of the Khasi community, who were believed to be the first ones to be settled on the earth, resided. One of the very many legends associated with the place is that the golden vine bridge perched atop the hill is indeed the bridge that connects earth and heaven. Lum Sohpetbneng is a revered pilgrimage and the Seng Khasi tribes hold an annual pilgrimage here in the month of February.